Note: Unfamiliar with CBD? Click here for a quick overview. Not sure which CBD vendor to buy from? For more vendor reviews, click here! Vermont-based Green Mountain CBD touts whole plant CBD extract that is lab tested for quality and consistency. They are a vetted vendor per r/CBD and sell their product in capsule form and as an edible salve. 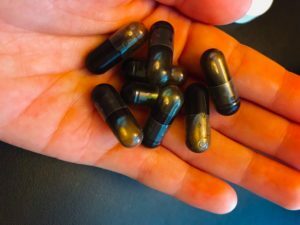 This review covers their capsules. Product Description: Made from organically farmed Vermont hemp. Extracted with organic coconut oil. Whole plant extract. I had high hopes for Green Mountain CBD, as many users from r/CBD seem to passionately advocate for their products. Despite the success stories, I didn’t have too great of an experience. At the start, I knew 20mg would likely be too strong for me, but decided to try it anyway. I was right. One capsule put me in a hazy headspace, where I found difficulty concentrating on cognitively demanding tasks. This spacey feeling may be due to the entourage effect, since the CBD is whole plant extract. However, Altus Labs CBD tablets are likely whole plant as well, and I didn’t experience haziness with their excellent product. I tried breaking out the pre-packaged 20mg dose into smaller amounts, but this was nearly impossible due to design. Each capsule contained a green oil substance smelling much like something Cannabis and coconut oil would give birth too. Since it’s oil, the CBD was difficult to wash away. While opening and closing the capsules, my hands would inevitably get very oily, making everything I touched afterward oily, leaving a cannabis + coconut-y smell as well. Because some oil inevitably escaped when tampering, I was never confident with how much I was actually taking, so the results were very mixed when trying to ration. I tried refrigerating the capsules to solidify the oil, as a possible solution, but the capsules would break when squeezing out the CBD and the oil would lose some of its form, making it still difficult to gauge the amount taken. This also wasn’t practical for on-the-go consumption, which is crucial for me because I prefer to take CBD as needed. Green Mountain CBD also gave me tension headaches, something I haven’t experienced with any other online CBD vendor (e.g. NuLeaf Naturals). Even at lower doses, the weird headache sensation persisted. With Green Mountain CBD, my anxiety wasn’t so much abated as it was masked by the fatigued confusion I felt. That is, I felt too sleepy and hazy to feel any extreme anxiety. I wouldn’t call it “relief,” since it wasn’t very comfortable. It was more like the nagging hazy sleepiness and headaches took precedence over any nagging anxieties. As for insomnia, I didn’t encounter any relief. It sounds paradoxical, but Green Mountain CBD felt activating when I tried to sleep after taking before bed. The expected fatigue and sleepiness was there, but I couldn’t fall asleep. I actually think the CBD made me stay up longer than had I not taken any. Unlike my experience with NuLeaf Naturals, I didn’t feel any relief from sleep anxiety either–just frustration for being stuck in a tired limbo between consciousness and subconsciousness. Taste-wise, Green Mountain CBD knocked it out of the park. The pleasant coconut flavor masked the somewhat unpleasant earthy taste of typical Cannabidiol products. The oily-ness was a bit gross, but coconut was definitely a refreshing change in flavor. Despite many rave online reviews, Green Mountain CBD didn’t work well for me in many departments. At $30 a bottle, it may be worth trying, but you’ve been warned! 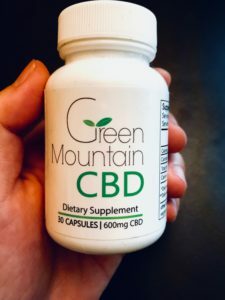 Despite a plethora of great online reviews, we didn't find Green Mountain CBD effective for anxiety or insomnia relief. If you've also tried CBD from Green Mountain CBD, submit a rating below or comment! I don’t think I would use this to make “Coke”. I could definitely see using it to make fruit flavored sparkling waters though. My husband and daughter would love it! I have been trying several different CBD oils for insomnia. Green mountain capsules have worked the best for me so far. I wake up refreshed. I stay asleep more often than not. If I do wake up, I am able to go back to sleep. I do take my CBD with 3-6 mg of melatonian (w/B6), 100mg 5htp, and a magnesium/Calciuim supplement. These are what my naturalpath doctor recommended. I am getting ready to cut back on the amount of CBD I take as I feel like I could use a little less now that my sleep is back. Hi SuzG – thanks for commenting! I’m so happy to hear that Green Mountain’s CBD capsules have been effective for you, as I know how debilitating insomnia can be. I’ve stopped taking them entirely, due to the side effects, but everybody is different :). May you continue to sleep well! This website online is really a walk-through for all of the information you wished about this and didn’t know who to ask. Glimpse here, and you’ll undoubtedly discover it. I respect your piece of work, appreciate it for all the interesting content. Aw, this was a really nice post. In idea I wish to put in writing like this additionally – taking time and precise effort to make a very good article… however what can I say… I procrastinate alot and not at all seem to get one thing done. Heya i’m for the first time here. I came across this board and I find It really helpful & it helped me out a lot. I’m hoping to present something again and aid others like you aided me. Please let me know if you’re looking for a author for your weblog. You have some really good articles and I think I would be a good asset. If you ever want to take some of the load off, I’d love to write some content for your blog in exchange for a link back to mine. Please blast me an e-mail if interested. Kudos! that sounds interesting. i’d definitely be open to having a conversation about you contributing.